Leia Organa, also referred to as Princess Leia, is a minifigure from the Star Wars theme. The first variation of Leia has her signature, brown hair that is parted to each in the middle with buns on each side. Her head is yellow with black pupil-less eyes and a pink lipstick smile. Her torso is completely white with her loose fitting senatorial shirt. The bottom of her torso features a grey, belt. Leia's legs are completely white. 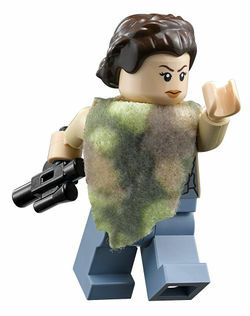 This variation of Leia has her wearing a brown, wavy hairpiece with a ponytail in the back. Her yellow head is the same that was used in her previous variation with the black pupil-less eyes and a pink lipstick smile. Her torso is yellow with a dark yellow belly button, dark yellow around the sides, depicting her femininity and a bronze bikini top with cleavage lines above it. Leia's legs and hips are yellow as well with her hips having a bronze bikini bottom with red cloth hanging down onto her legs. Leia's Hoth variation's head and hair are the same as her first version. Her torso is primarily a beige parka with her Rebellion insignia on the left hand corner. Underneath her parka is a white sweater. Leia's arms are white, her hands are yellow and her blank legs are completely white. Leia's Bespin variation does retain her head piece from her previous variations but this time includes a hairpiece originally molded for her mother. This hair piece is brown with a braid that runs around the front and attaches to her large, braided ponytail on the back, that goes down until the end of her torso. Her torso is primarily a white, turtleneck sweater with a light brown shirt underneath. Her unprinted leg piece is completely brown. Leia Organa was the secret daughter of Padme Amidala of Naboo and Sith Lord Darth Vader (previously Anakin Skywalker) of Tatooine, and twin sister of Luke Skywalker. When her mother died after giving birth to her and Luke, she was adopted by Bail Organa and lived on Alderaan for the next 19 years. She became one of the youngest senators during the Galactic Empire and, along with her surrogate father, she assisted the Alliance to Restore the Republic - also known as the Rebel Alliance. After she was captured by her real father, Darth Vader, for stealing the secret Death Star plans and sending them to Ben Kenobi, she witnessed the destruction of Alderaan aboard the first Death Star. She was soon rescued by Luke (her brother), Han Solo, and Chewbacca. Afterwards, she and Han began to have a connection, and after a narrow escape from Hoth, and a second capture on Cloud City, they realized they loved each other. One year later, she found out she was the sister of Luke. She, Chewbacca, Han Solo, C-3PO, and R2-D2 helped destroy the shield bunker on the forest moon of Endor so that Lando Calrissian and the rebel fleet could destroy the Death Star II, dealing a death blow to the Galactic Empire. In the end, she says she feels that Luke flew out of the second Death Star before it blew. This gives a hint that she can use the Force. In the 2011 redesign she has the same face as Princess Tamina from the Prince of Persia: The Sands of Time theme. The new design also had a different, exclusive hair piece. In the video games, a player being Princess Leia (Slave) can hold 'Z' to to make Leia swing her arms in the air and swing and shake her back end and hips. Leia's Ewok Village outfit shares the same hairstyle as the Forest Maiden minifigure. There are rare misprints of Leia with smooth hair as opposed to the wavy hair piece she typically has. This page was last edited on 1 September 2017, at 02:35.